New article over in Whale Road Literary Review on “Snowball Dialouge” a writing technique I’ve used with students in the Sensorimotor Poetry Workshops. While this article talks specifically about moments of peer learning in the workshop space, I've also used this as a strategy to help communicate and co-regulate with students in the day-to-day as well. It's a good back pocket tool for any educator! Black text on a white background. The top has the masthead for Whale Road Review with four lines right aligned indicating an online drop down menu. Below that masthead is the start of the article with “Snowball Dialogue” in bold, black title lettering and the article lettering beginning in paragraph form below. Today marked the start of a new project with one of the workshops. Rather than building a collaborative poem off of a few lines from each poet, we're writing, revising, and (eventually) publishing full, individual poems. Image of a poem written in black marker on a school white board. Photo editing has given everything a slight burnt tint. 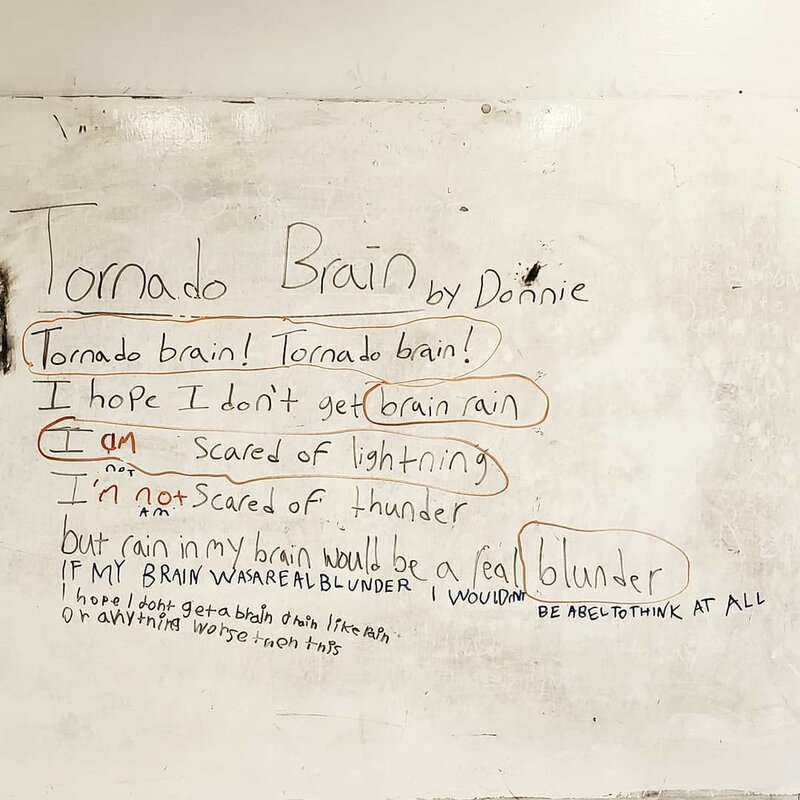 The poem’s title says “Tornado Brain” by Donnie. Parts of the poem are circled in orange, and brown other lines have writing around them in blue and purple ink. Before summer break, every poet wrote a full piece on the prompt Tornado Brain, myself included. In introducing the idea of editing and revising I wanted to use my work rather than make any one post feel picked out. This not only takes away the anxiousness of having a poem critiqued, but it gives me the chance to model, as facilitator, the way to accept and process feedback. It also allows the poets to tackle this new subject as a group and use the collaborating, social skills they have in place from the group writing projects. The idea of finding something to change was initially off putting to some of the poets and, admittedly, I don't know what I would have done in school if a teacher gave me a lesson saying, "okay, what would you change about this poem I wrote?" Two strategies I found that worked: asking the poets to identify what they like and have them circle it and asking them to make additions to the text. Circling was a good entry way into the text because once they showed me what they liked they were more equipped to talk about what they didn't. Whether that's because it helped them identify their preferences or because it's socially easier to give someone a compliment sandwich, I'm not sure. In either case, it helped lead to productive conversations and, as you can tell in the picture, even the circled favorite of one poet proved an area of critique for another. In asking for additions instead of changes, a couple poets were able to interact with the text and give it a personal sense of completion. Once the additions were made, it was easier to talk about the full text, including their suggested additions. The explanations for why their additions made sense often highlighted elements of the piece they did or didn't like and served as nice opportunities for myself, other facilitators, and peer poets in the room to interject or agree. Another technique that seemed to work for this lesson was having every student use their own color marker at the start. While some overlap eventually happened (best laid plans...) this was nice while it lasted! It not only let me see the work of each individual poet, but it made it easy for them to see what each other thought and, in turn, to respond to each other's comment. Next time I'll try and keep the colors a little more carefully coordinated! After the success of this, I was hoping the poets would be ready to edit their own pieces, but that was definitely a rushed thought. The poets hesitated and rightfully so. Not only is this something new, but it's something a lot scarier than any reading and/or writing exercise we've done. I think workshops are scary! I just know that the end result is a much better, tighter draft and these poets need to see that pay off before they put themselves out there. I was focused on having this be a summer project, ending with a summer school publication, but I need to step back and enjoy the process. Next session I'm planning to bring my revisions so that they can see how I've accepted their changes and maybe I'll have them go at it again to get some more practice in and, hopefully, see that it can be a good thing to have other poets read and interact with your work. When I present about the workshops, people often ask how I support students with limited verbal skills. Here are three examples of tools I've used or am using. "Setting / Character / Plot" is a chart for one of my reading groups. In the session, a student with developmental and emotional needs feels more comfortable writing out ideas than sharing aloud (often asking that no one watches while they write). I created this chart for the group to fill out together at the start of every session, giving all the readers in the group an opportunity to share their knowledge of the story and review it as a whole rather than putting any one of them on the spot. Brown Butcher paper with writing and drawing in black, green, purple, and blue expo marker. The first part of the title is censored in black but the next two words read “Idea Board” the handwriting is difficult to read as are a lot of the drawings, though some are clearly of animals like a Guinea Pig and Turtle. "Idea Board" is a space for a poet with limited verbal skills, but who is often more regulated while drawing and writing. The poster paper's size gives them the opportunity to share their thoughts and contributions with the whole workshop while remaining more grounded and engaged. On a school white board a chart is written in black expo marker. The chart has two rows and four columns. The title of the chart is “Movement Word Wall” The top row reads from left to right: “Fast Skip Run Left” with each of those words in their own column. The bottom row reads from left to right: “Slow Walk March Right” with each of those words in their own column. "Movement Wall" is for a poet who uses a device to communicate. During a specific movement activity I set up this world wall for them to go and tap (currently working to get the words programmed in) like they would their device to make their choice. This is also a nice visual cue for poets in the group who, while able to verbally communicate, might have difficulties coming up with movement ideas. These are just a start and have had various successes and failures, if you test these out I'd love to hear how they work in your groups and how you've tweaked them to meet the needs of your students!